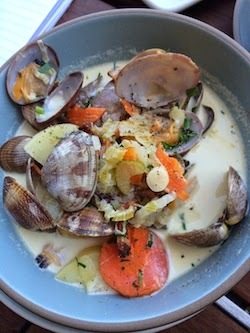 Hog Island Oyster Co. Bar has long been one of my favorite little hideaways at the San Francisco Ferry Plaza. Tucked away in an awkward spot, it had fantastic views of the Bay Bridge and soul soothing clam chowder, not to mention an always stellar range of oysters on the half shell. The space is certainly not awkward any longer. Now that the oyster bar has taken over the adjacent spot, it’s a spacious and nicely unified expanse with two bars and plenty of outdoor seating. The menu is larger too. My picks are still the classic clam chowder that has no flour so it’s rich and creamy, not goopy, and the white anchovies. 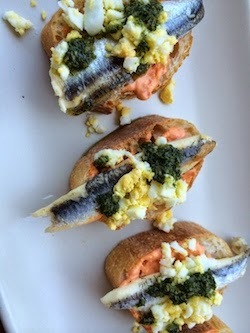 Served with piquillo pepper aioli, chopped eggs and green herb sauce on baguette slices, the anchovies are are bright and juicy, nothing like what you get out of a can. In case you didn't know, Hog Island was founded by two marine biologists who are passionate about the future of sustainable seafood. 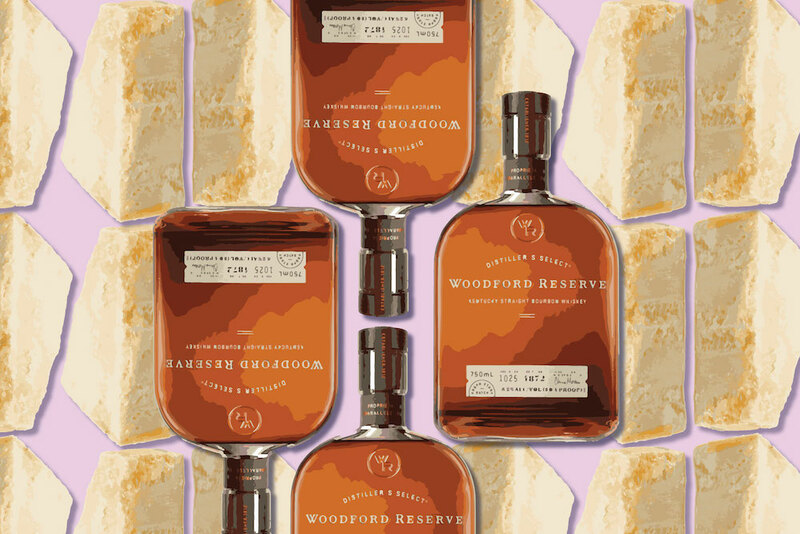 Originally founded in 1893, Schroeder’s was long overdue for an overhaul. The German style beer hall has a brighter, cleaner, more sophisticated look and also a much greater emphasis on food. 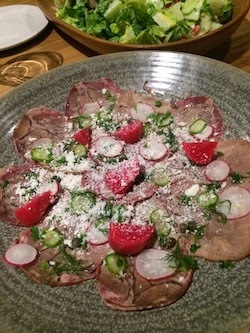 Chef Manfred Wrembel has German parents but grew up in California so he has a lighter touch with the more traditionally heavy cuisine. 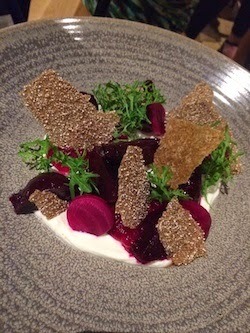 At a recent preview my favorite dishes were the delicate beef tongue, sliced paper thin and served with capers, radishes and creme fraiche and the beet salad with crisp thin pumpernickel wafers and goat cheese; a very refined version of what’s become a classic salad. Chino is one of the newest restaurants in town, it opened just this week. It was inspired by owner Joe Hargrave’s love of Chinese dumplings and cocktails and desire to enjoy them together. 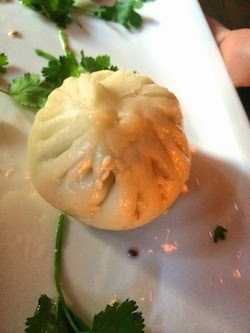 I tried several dishes and the dumplings were superb. They should be, they hired a veteran dumpling maker previously at The Mandarin. The gingery chicken dumpling was my favorite. 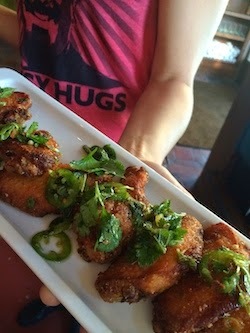 I also loved the rich and sticky pork tamarind hoisin riblets and the super tangy and crisp chicken wings a recipe from Nick Balla, currently the chef at Bar Tartine, from when he was cooking Asian food. Last but not least, a restaurant that has not yet opened, Pabu is a collaboration between Michael Mina and Ken Tominaga who is known for his much acclaimed sushi spot Hana in Rohnert Park (he also previously worked with Cindy Pawlcyn at Go Fish in Napa). The restaurant will be opening up in the old Atrium space at 101 California Street. The preview pop-up just had a few nibbles, but the Happy Spoon is reason enough to check it out. 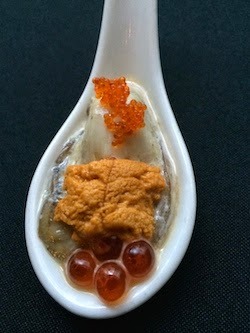 It’s basically some of the tastiest things all combined—a raw oyster, salmon roe, Santa Barbara sea urchin, tobiko and a ponzu creme fraiche. This is a tried and true dish from Pabu in Baltimore, and sure to make a splash here as well.